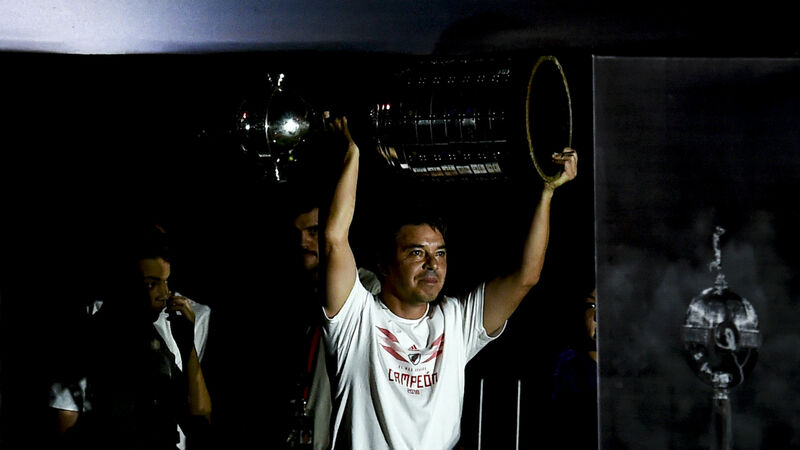 River Plate head coach Marcelo Gallardo told supporters the club's Copa Libertadores triumph over Boca Juniors "will live forever in our hearts". Following a second leg of the final that was twice postponed after a group of River fans attacked the Boca team bus on its way to El Monumental and belatedly rescheduled and relocated to Madrid, Gallardo's men sealed a 5-3 aggregate triumph in extra time at the Santiago Bernabeu. That meant a foray into the Club World Cup and an embarrassing penalty shootout defeat to Al Ain in the semi-finals. River signed off with a 4-0 thrashing of Kashima Antlers in the third-place match but, speaking at a homecoming presentation at their packed stadium in Buenos Aires, Gallardo was well aware his team's efforts in the UAE will not be dwelt upon after what they accomplished in the Libertadores against their bitter rivals. ¡La vuelta olímpica en el Monumental! #ElMásGr4ndeDeLaHistoria y el aliento de su gente en una fiesta inolvidable. La Copa está en casa. "Thank you for supporting us, standing with us, thanks for cheering us up, thanks for all the love shown to us for all these years," said the 42-year-old, who also lifted South America's premier club trophy with River in 2015. "It is a great feeling, what I'm feeling right now, I am really grateful to share this with all these players. "[I told you before] we were going to push for more, do you remember? And we did not just push for more, we won the most desired final in the world. "We will not forget this. This will be eternal and it will live forever in our hearts. So thanks to every one of you, because you also deserved this." River have been drawn alongside Internacional, Alianza Lima and a qualifier in Group A for their Libertadores defence next year and face Atletico Paranaense in the Recopa Sudamericana on February 20.